Lord Rama was the seventh incarnation of Lord Vishnu who descended on earth during the Treta yuga. He was born on the ninth day of the waxing phase of the Hindu month of Chaitra. The day is famously celebrated as Ram Naomi. Lord Rama was born in the Sun Dynasty of King Dashrath who descended on earth to defeat the unrighteous King Ravana of Lanka. On the ninth day of the Durga Puja of Chaitra (April) month, the festival is celebrated all over India with great pomp and show. Lord Rama is revered as the hero of epic Ramayana. He is always portrayed as holding a bow and arrow, which shows he is always ready to fight against evil. There are numerous Lord Rama Temples across India and mostly in all these temples the Lord is mainly portrayed in a family style, flanked by his wife Sita, brother Lakshman and devotee Hanuman who is sitting beside Lord Rama with his hands clasped. Lord Rama is an ideal example of a son, brother, husband, king, friend and enemy. As mentioned in the Hindu religion, Lord Rama is the one who has been looked upon by each and every man. Puja to be performed on the day of Ram Naomi is quite simple. Generally, there are no particular rituals mentioned in the scriptures to be performed on the day of Ram Naomi. Devotees visit Lord Rama temple in the morning and listen to various legends associated with the birth and life story of Lord Rama. Holy mantras are recited on the day of Ram Naomi. After the Puja is performed, holy water used during the Puja is sprinkled over the devotees. As per the tradition, the youngest female member of the family then applies tika to all other members of the family and at last, prasadam is distributed amongst all. Again, all devotees keep fast on the day; some observe a whole day fast, while others prefer to be on a Satvik food without salt. There are many who also perform Nirjal fast on this auspicious day i.e. the one performed without water. However, Satvik fasting is most popular and this kind of fast is the one where the devotees only take phalar in the afternoon. Again, tea, coffee, curd, milk and water are also permitted. Phalar consists of a sweet made of khoya; potatoes prepared with all spices except turmeric, garlic, ginger or onion. In phalar, all root vegetables are allowed to be consumed, but no green vegetables are permitted. Fruit of every kind is also allowed. Puri is made with kuttu-singhare-ka atta. Procedure to make Puri: There are two different types of root vegetables which are dried and ground into flour and mixed, and used instead of wheat flour. They don’t hold very well; therefore, boiled arvi is mashed and mixed with the dry atta. It is then mixed in water to form pliable dough to make puri or pakori as one likes. Preparations Done: Puja on Ram Naomi is generally performed in a large room. Since morning devotees get engaged in Bhana and Kirtana, sing in praise of Lord Rama, Sita, Lakshman, and Hanuman. As per the Hindu Puja rituals no Puja can commence without appeasing Lord Ganesha. Thus on the day of Ram Naomi, Lord Ganesha is appeased by performing various rituals following which the Ram Naomi Puja takes place. The puja room is cleaned and spruced up. A jyot (diya) and some incense like agarbatti and gugal are ignited and some flowers are decorated in front of the family deities. Generally, garlands are bought for all images or pictures, failing which fresh flowers are decorated or put in vases to make the place delightful and pure. Thaali Consists of water, roli, aipun, rice and flowers, the bell and the conch shell is placed in front. The thaali containing the prasad is placed on the side on a chowki or dais. In Sat Yuga there lived a great sage named Gautama who used to reside with his wife Ahilya in his ashram. The couple was highly revered for their austerities and devotion to the Lord. Ahilya was a devoted wife who was extremely virtuous and beautiful. Unfortunately, Indra fell in love with her and his carnal desires for her grew to the extent that he entrapped her into wrong deeds. Once while Sage Gautama was away from the ashram, Indra came disguised as Gautama and entered into a physical relation with Ahilya. When Gautama recognized his wife’s mistake his anger knew no bounds; he left the ashram and started residing in the Himalayas. To provide solace to his wife, he assured her that all her guilt will end and she will regain her virtuous status in the Treta Yuga, when Lord Rama along with Sage Vishwamitra would visit her ashram and bless her. Ravana was an ardent follower of Lord Brahma and with his long and severe penance he had succeeded in gaining the blessings of Lord Brahma and turned out to be invincible. Unfortunately, Ravana failed to divert his powers for the welfare of humanity and became extremely egotistical. All the gods and goddesses became concerned of Ravana’s atrocities on earth. At the same time, Lord Vishnu arrived on his vahan (vehicle) the Garud. Lord Brahma gave Vishnu a hint that the time had come for him to descend on earth in the avatar of Lord Rama. As mentioned in ancient Indian scriptures, in the Treta yuga King Dasarath (or Dashrath) and his wife Kaushalya prayed with great devotion Lord Vishnu to beget him as their son. King Dasarath also performed Ashwamedh Yagna and Putrakameshti Yagna for a son. While on the verge of completion of Yagna, a male figure emerged out of the sacrificial fire; he was dark and clad in crimson. He gave away a bowl to King Dasarath and asked him to distribute its content amongst all his three queens. Kaushalya, Sumitra and Kaikeyi partook of the bowl’s content after which Kaushalya gave birth to Lord Rama, Sumitra to Lakshman and Shatrughan, and Kaikeyi to Bharata. All the brothers are believed to be the amsha (part) of Lord Vishnu. All the brothers were tremendously in love with one another; the three younger brothers Lakshman, Shatrughan and Bharata revered their eldest brother Lord Rama as god. 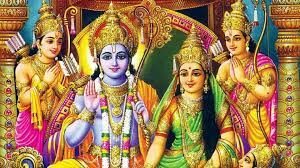 However, Lord Rama, his wife Sita and brother Lakshman led a life of austerity and their struggle against evil (Ravana) forms the essence of the epic the Ramayana. On Ram Naomi, the principle of Sri Rama is believed to be 1000 times more efficient and active than any other day of the year. As per the rule, if a certain principle is more active on a particular day, it is most advisable to chant that principle on that particular day as it gives most benefits. Thus, on Ram Naomi, the chanting of ‘Sree Rama Jai Ram Jai Jai Ram’ is highly recommended. In the principle of Sri Rama the manifest energy is 75% in comparison to the manifest energy present in the principles of other deities which is around 10%. A manifest energy is the one which is utilized while carrying out a particular mission. The other less important energies are the dormant energies and called un-manifest energies. 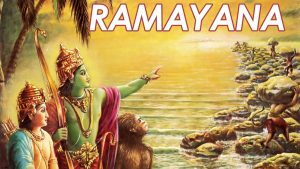 Sri Rama’s mission in the great epic the Ramayana is to eradicate evil (Ravana) and reinstate righteousness which requires a lot of energy. Hence, in Sri Rama’s principle the manifest energy is 75% while the un-manifest energy is only 25%. While chanting the principle of god one requires to exhibit complete faith and spiritual emotion towards god without which accomplishing the mission is impossible. Knowledge of the divine qualities of the particular incarnation of the Lord tremendously helps in the generation of spiritual emotion (bhav) towards him. He is an embodiment of humanity in real terms. Thus Ram Noami is celebrated to commemorate all the ideals or noble deeds which Lord Rama symbolizes. The victory of good over evil forms the basis of this festival. On the day of Ram Naomi, over 10,000 devotees visit sacred places linked to Lord Rama including Ayodhya, Rameshwaram, and Ujjain. In Rameshwaram, devotees take a ritual bath in the sea before entering the Ramanathaswamy temple. On Ram Noami, many North Indian pilgrimage places host grand fairs as part of the celebrations, culminating in magnificent fireworks.